The best known region of the Theban necropolis is Sheikh Abd el-Qurna (25°44′ N, 32°36′ E), named after the little shrine of a local saint on top of the hill. The ancient cemetery designated by this modern name consists of three parts: (1) the main hill, surrounded by the "upper enclosure wall," erected by Sir Robert Mond at the beginning of the twentieth century; (2) the plain at the foot of the hill, directly west of the Ramesseum; and (3) a small region, topographically better assigned to el-Khokha, called the "lower enclosure," named after a surrounding wall built under Mond’s supervision. The "lower enclosure" forms the end of the northern access road to the main hill of Sheikh Abd el-Qurna and is a natural continuation of el-Khokha. Many tombs of the 18th Dynasty line the sides of this road. After the Amarna period, the road seems to have had no further use; three important tombs of the 19th Dynasty were constructed at the end and directly in the middle of the former road. The earliest tombs in the region of Sheikh Abd el-Qurna date from the second half of the 11th Dynasty and from the very beginning of the 12th Dynasty. In contrast to the New Kingdom, when only the eastern half of the hill was in use as a cemetery, during the Middle Kingdom all slopes of the hill were occupied by tombs. Every side of Sheikh Abd el-Qurna afforded a view of the royal mortuary temples and their causeways. Unfortunately, only two of the numerous saff and corridor-shaped tombs, belonging to Herbert Winlock’s cemeteries no. 800 and 1100, have been entered into the official numbered list of Theban tombs (nos. 60 and 103 according to the bibliography of Porter and Moss). The architectural development of these Middle Kingdom tombs has been investigated by Dieter Arnold in his publication of the tomb of Intef. Although there are no decorated tombs of the 17th Dynasty at Sheikh Abd el-Qurna, Friederike Kampp has pointed out that there can be no doubt about an occupation of the site during this period, because of some significant architectural features, visible in otherwise undated constructions. The first decorated tombs from the beginning of the New Kingdom at Sheikh Abd el-Qurna can be dated to the reigns of Ahmose, Amenhotep I and Tuthmose I. From this period until the reign of Amenhotep III, Sheikh Abd el-Qurna became the most popular part of the Theban necropolis. All the highest ranking officials and priests built their tombs in this region, following geographically the order of the royal mortuary buildings from north to south. The connection with the position of the tombs, the social rank of their owners and the orientation to the mortuary temples has been worked out by Wolfgang Helck and had already been mentioned by Georg Steindorff and Walther Wolf. As most of the upper parts of Sheikh Abd el-Qurna had been occupied at the end of the reign of Amenhotep II, the majority of the tombs dating to the time of Tuthmose IV and Amenhotep III are situated in the lower regions of this site. However, it was not only the density of occupation which caused the high rank officials of Amenhotep III to erect their tombs in the plain. As in el-Asasif, the new type of enlarged tombs reminiscent of funerary temples needed not only sufficient space for constructing the sunken courtyards and the huge inner halls, but also a good quality of rock, which is not to be found in the upper parts of the hill. In the first half of the Ramesside period (19th-20th Dynasties) the lower regions of Sheikh Abd el-Qurna were used as a cemetery of some importance. Aside from three major tombs in the area of the "lower enclosure," most of the minor Ramesside tombs were cut into the side walls of the already existing courtyards of 18th Dynasty tombs. With the 20th Dynasty a new era of tomb usurpation began; many tombs at Sheikh Abd el-Qurna were reused in this period, some of them receiving new decoration or architectural modifications. During the Third Intermediate Period most of the tombs at Sheikh Abd el-Qurna, as in the other parts of the Necropolis, served as places for simple burials, and until the end of Dynastic Egypt there were no further rock-cut tombs constructed at Sheikh Abd el-Qurna. The most important tombs of Sheikh Abd el-Qurna are listed below in chronological order, according to their numbers (TT=Theban Tomb), giving the name and title of the tomb owners. El-Tarif is a prehistoric site situated on the west bank of the Nile (25°44′ N, 32°38′ E), about 5km north of Sheikh Abd el-Gurna, at the foot of the Theban cliffs. It has been known for a long time as part of a Theban cemetery from the Old and Middle Kingdoms, and since the 1970s it has also been identified as an important Predynastic site. The site was first mentioned in the years 1826-30, and is indicated on the map made by the English Egyptologist Sir John Gardner Wilkinson, and a Scottish traveler and collector, Robert Hay. Later it was investigated by the Italian Egyptologist Ernesto Schiaparelli and Flinders Petrie (in 1908-9), after which it became covered by the contemporary village of el-Tarif. Exploration of the site was again taken up by Dieter Arnold (1970-4), and its Predynastic evidence was later investigated by a Polish team, Bolesltaw Ginter, Janusz Koztlowski and Joachim Sliwa (1978-82). The cemetery of el-Tarif is very large. It covers an area circa 1200m (north-south) by 600m (east-west), which corresponds to what Petrie called cemeteries "A" and "B." According to Petrie, these cemeteries date to the 11th and 12th Dynasties; however, their precise location is not known. The most important part of the cemetery consisted of the graves of the first three kings of the 11th Dynasty, described by Arnold as the so-called saff (row) tombs. The best archaeological stratigraphy was found in the area between two 4th Dynasty tombs (mastabas) excavated by Arnold. The bedrock in that area consisted of sediments of the younger gravel pediment on which the two mastabas were built. In the top part of the gravel pediment, Late Paleolithic stone tools were discovered. This stone tool industry shows affiliations with the Late Paleolithic units found in Nubia (such as the Qadan). The sediments of the younger gravel pediment are overlain by a soil formed by eolian activity, which contains stone tools now known as the "Tarifian," dating to the early Holocene. In the course of systematic excavations of the area in between the two mastabas, a concentration of about 3,200 flint artifacts was discovered around a hearth. This is primarily a stone tool industry of flakes dominated by retouched flakes and atypical scrapers, followed by end-scrapers, perforators and denticulated-notched tools. Burins and microliths are few in number. The closest stone tool industry to that of the Tarifian is the Post-Shamarkian industry, known in Nubia. It is also characterized by the development of flakes, the gradual disappearance of microliths and the appearance of Neolithic elements, such as the bifacial tools and axes made from cores. 3 sherds of medium-thickness vessels, straw tempered, with mineral inclusions (crushed stone). Although the Tarifian layer did not contain organic remains, the character of the camp, with no habitation structures and absence of wear on stone tools which would point to their use as sickles, suggests a hunting-gathering-fishing subsistence. The data from the sediments suggest that the Tarifian developed in a dry period when there was eolian activity, possibly in the sixth millennium BC. This preceded another wet event when rain channels formed, associated with a Predynastic Nagada culture settlement (fourth millennium BC). With the discovery of more Tarifian sites in the Theban region south of Gurna, the first radiocarbon date for the Tarifian site of MA 2/83 was obtained (calibrated, circa 5,200 BC). The Tarifian was probably derived from local Epi-paleolithic cultures with microlithic and geometric stone tool industries. Its foraging economy is accompanied by the first ceramics in the Nile Valley. 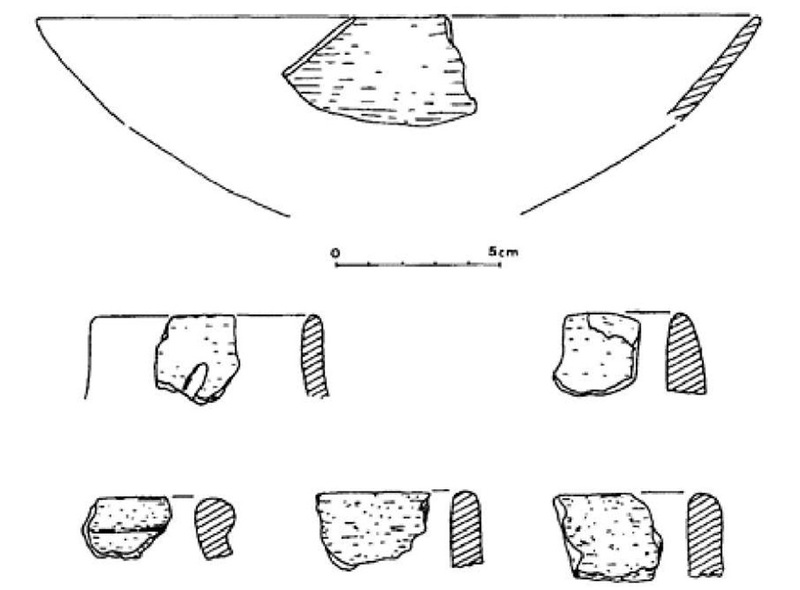 At the site of Hamamieh in Middle Egypt, in the lowermost layers of the trial trench, a similar stone tool industry of flakes was excavated with ceramics which included sherds like those of the Tarifian as well as the characteristic rippled ware of the Badarian culture. Above the Tarifian layer at el-Tarif was a sterile layer with materials washed from the slopes of cliff. Here the site yielded distinct traces of Nagada culture occupation, with two dwellings with stone foundations and four hearths. The hearths formed a semicircle around the stone dwellings. One hearth was made in a shallow basin, which prior to firing had been coated with Nile silt. Dwelling 1 was rectangular, with slightly rounded corners (approximately 3.5×2.0×5.0m). The foundation was built of two rows of large stones, in between which was fill of gravel and small stones. Dwelling 2 was also rectangular (3.0x 1.5m), but no double foundation was visible. The two dwellings from el-Tarif are the first well-documented construction of stone foundations for the Predynastic culture of Upper Egypt. The Nagada culture layer at el-Tarif consisted of three phases of occupation which yielded more than 3,400 potsherds, predominantly (more than 80 percent) of a ware with much organic temper. This ware most closely resembles the ceramics from the el-Khattara sites in the Nagada region, excavated in the 1970s by Fekri Hassan and T.R.Hayes, where "rough brown" ceramics are predominant. The el-Tarif sherds mostly come from flat-bottomed, hole-mouthed pots and various bowls, grayish-brown in color, but some with a reddish-brown slip. Less numerous was red-polished pottery (circa 10 percent), and blacktopped pottery (circa 20 percent). A group of pottery specific to this site was decorated with carefully spaced impressions, in round, triangular or fish-scale shapes. The very rich stone tool industry from the Nagada layer is characterized by the manufacture of blades. A new tool type consists of rectangular sickle blades. Tools with bifacial retouch were also used as sickles. Chipped stone axes occur occasionally. In general, this industry differs from other known Nagada culture stone tool assemblages. The Nagada culture evidence at el-Tarif also included plant remains, such as grains of emmer wheat and barley, but the faunal remains (domesticated sheep and goats) were poorly preserved. One of the hearths from the Nagadan layer yielded a (calibrated) radiocarbon date of 3,715 BC (Gd-689). Another dating technique, thermoluminescence, was used in the 1970s on samples of the Nagada culture pottery from this site, yielding slightly older dates of 3,810 BC and 4,340 BC. The term "saf-tomb" applies to an important provincial type of tomb which developed locally in the Theban area during the First Intermediate Period and found its monumental expression in the tombs of the Theban kings of the early 11th Dynasty. This type of tomb, which probably derives from earlier types built during the late Old Kingdom, consists of a large court and comparatively small interior rooms. The saf-tomb’s main feature is a single or double row of pillars cut out of the hard gravel along the rear end of the courts. The Arabic term "saff" ("row") refers to the row of openings between the pillars, which have been misunderstood as entrances into separate, aligned burial chambers. With few exceptions (such as the tomb of Intefiker and Intef at Dendera), this type of tomb is restricted to the Theban site of el-Tarif, an extensive cemetery which stretches in the low desert northeast of the mortuary temple of Seti I, and just opposite the temple of Karnak on the west bank of the Nile. The cemetery covers an area approximately 1.2km north-south and 0.6km east-west, and comprises an estimated 300-400 saff-tombs. The cemetery of el-Tarif has never been systematically investigated. Between 1860 and 1889 several sondages were carried out by Auguste Mariette, Gaston Maspero and Georges Daressy, who found parts of a stela (CG 20512) of the Theban king Wahankh Intef II. Flinders Petrie excavated some of the smaller tombs in 1908-9, but did not mention the royal tombs in his publication. Between 1966 and 1974 Dieter Arnold conducted systematic excavations in the royal tombs, which provided new insights into their structure, arrangement and sequence. In addition, a survey map of the whole cemetery was prepared on a scale 1:1000, including all saff-tombs which were visible on the ground. The cemetery centers around three monumental royal tombs which are known under their local names: Saff el-Dawaba, Saff el-Kisasija and Saff el-Baqar (in early maps "Ssaft-el-leben"). The courts of the tombs, 65-80m wide and 100-300m long, were sunk about 5m deep into the low desert with the gravel of their excavations piled up high on either side and originally retained by mudbrick walls. With the exception of the Saff el-Kisasija, where the remains of a chapel-like mudbrick structure and wall were found at the eastern end, the front part of these courts seems to have remained open. Two rows of 20-24 pillars are cut out of the hard gravel along the rear end of the courts and form the actual front of the tombs. Behind the pillars in the center of the back wall, a short narrow corridor leads into the royal cult chamber, with two pillars supporting the ceiling. From the cult chamber, either a sloping passage or a vertical shaft gives access to the burial chamber, where the king was buried in a stone sarcophagus. More corridors and chambers of similar plan but smaller, which served as tombs for members of the royal family and other courtiers, are cut in the back wall on either side of the royal chambers, as well as along the side walls of the court. With the exception of small stelae, the narrow corridors and chambers of the saff-tombs probably remained undecorated, although the walls seem to have been plastered. More elaborately furnished was the Saff el-Baqar, where the floor of the central corridor was covered with sandstone slabs and the walls were lined with limestone. No evidence has been found for pyramids associated with the royal tombs of el-Tarif, as postulated by Mariette and others. According to the fragments of a stela (CG 20512) found in the eastern end of the Saff el-Kisasija’s chapel, this tomb belonged to Wahankh Intef II. Carved on the stela are figures of the king and his five dogs, who are all named. No textual evidence was found concerning the owners of the other two royal tombs, but archaeological evidence proved that the Saff el-Baqar was built later than the Saff el-Kisasija, while the Saff el-Dawaba was the earliest of the group. Based upon this sequence, the Saff el-Dawaba has been attributed to Sehertawi Intef I and the Saff el-Baqar to Nakhtnebtepnefer Intef III. Little is known about the private tombs, which have never been systematically explored. They are of the same type but much smaller than the royal monuments. The survey of the accessible tombs has shown that there are two groups. A probably earlier group of tombs has just a single pillar supporting the ceiling of the cult chamber, while later tombs seem to have adopted two pillars. Deprived of their stelae and otherwise undecorated, their owners remain unknown.